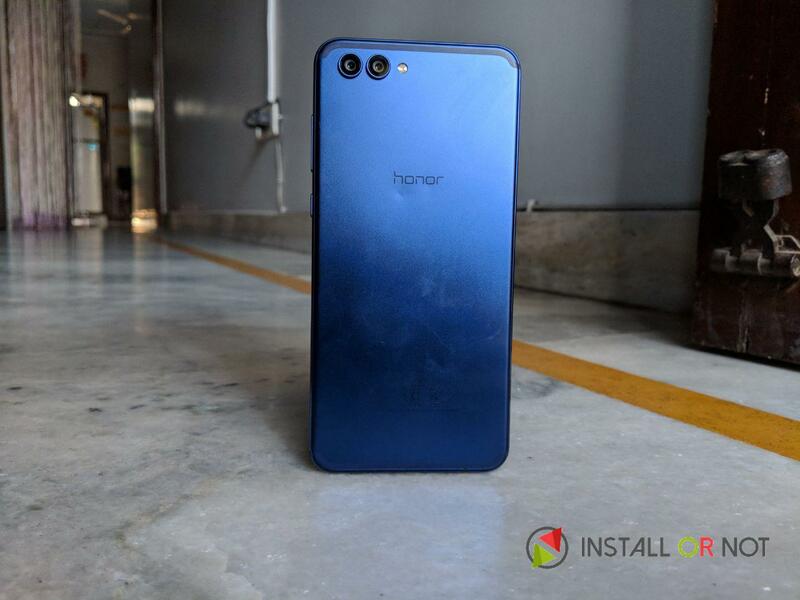 Not everyone can afford a $1000 (INR 65000+) smartphone and alternatives such as the OnePlus 5T and the Honor View 10 can perfect fit in and they should definitely have your attention. 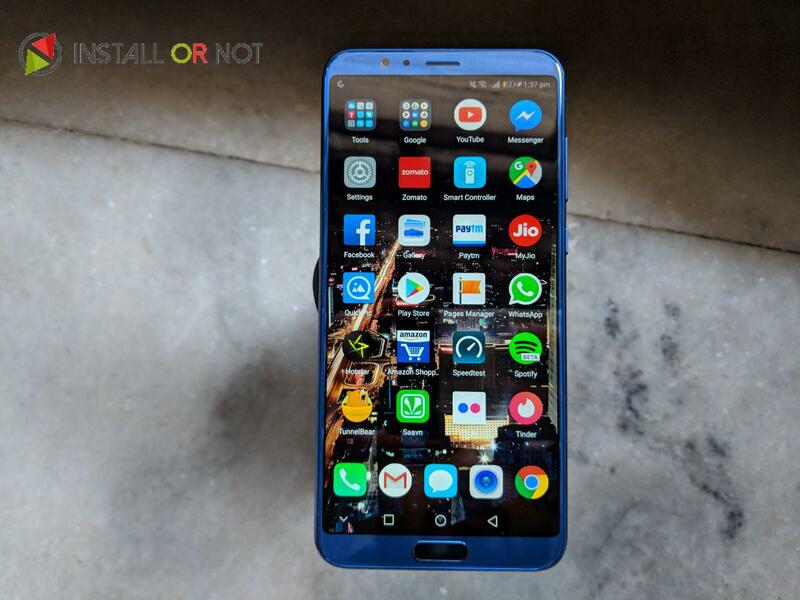 The Honor View 10 is the latest mid-range smartphone launched by Honor and we have been testing the device for about 2 weeks now and here we present you our comprehensive Honor View 10 Review. The first thing you’ll notice when you pick up the Honor View 10 is the build quality of the device, at 6.97mm-thin the View 10 is quite slim. The device features a large 5.99in 18:9 LTPS IPS display but the device doesn’t feel bulky, all thanks to thin bezels. The design chassis of the View 10 is nothing refreshing and looks a bit dated. 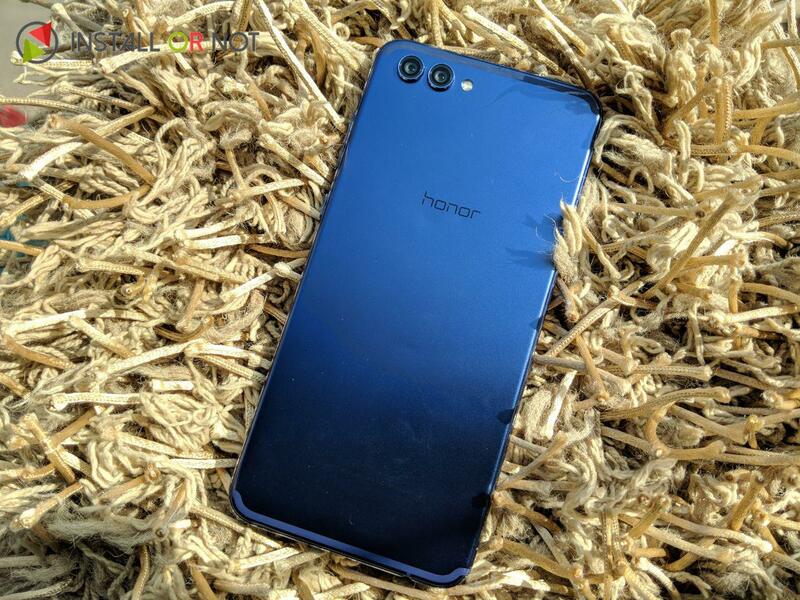 However, instead of improving on the glass-backed design of the Honor 9 and 8, the View 10 adopts the mighty aluminium rear panel from the Honor 8 Pro. The metal rear build will at least survive a few knocks and bumps – especially with each corner cushioned to resist impacts. And and the metal back is less prone to fingerprint smudging and doesn’t need constant cleaning. The fingerprint sensor finds a spot at the front and squeezes just below the display. We personally don’t approve of front fingerprint sensor but that is something that one can get used to and is not much of an issue here. 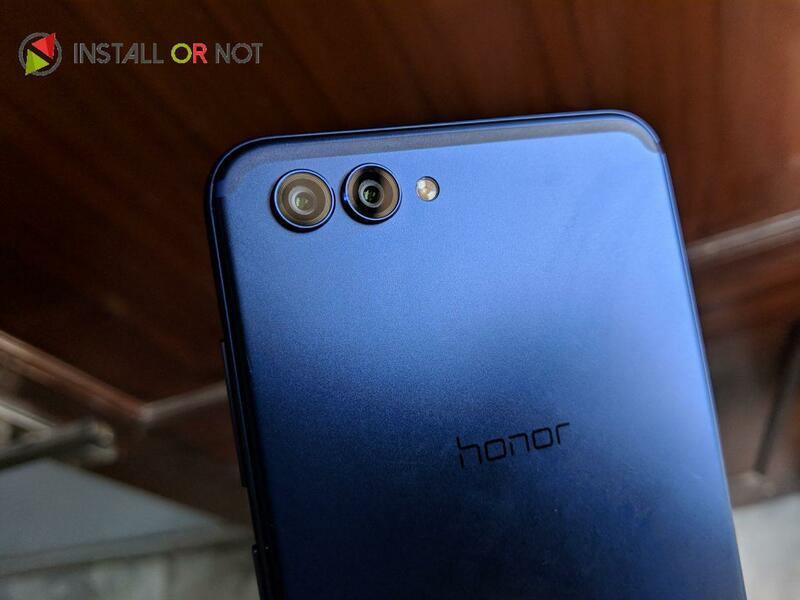 The rear fingerprint sensor is now considered as Honor’s trademark but not everyone is going to like the way they poke out of the chassis. Overall we really appreciate the design of the View 10 and every aspect of its design is functional. No fragile glass backing or curved display, sturdy metal backing, the device is solid as Rock (Dwayne Johnson). Ohh yes, we totally forgot to mention, this device has retained the 3.5mm jack (on the bottom edge). We are glad Honor didn’t inexplicably decide to remove the legacy audio part that is being removed by some manufacturers. The device features a 5.99-inch 18:9 FullView display which is powered by an Octa-Core HiSilicon Kirin 970 10nm SoC with a dedicated neural network processing unit. The main highlight of the device is its dual rear camera module, the View 10 features a 16-megapixel RGB sensor along with 20-megapixel monochrome sensor with Artificial intelligence engine. Here is the complete specification list below. The Honor View 10 comes with an Octa-Core Huawei Kirin 970 processor which is the same chip found in the more expensive brother the Huawei Mate 10 Pro. Also one of the chip’s most innovative features is that it has a dedicated core to AI computations – the NPU (neural processing unit). This NPU enables on-device machine learning processing and helps the phone learn from the way you use your phone. 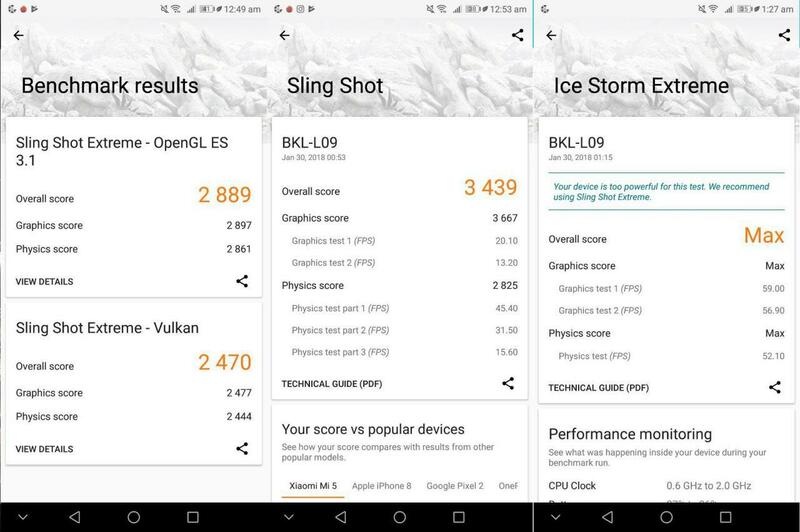 Games like Modern Combat, which now have been optimised for the 18:9 aspect screen, barely drop a frame, and there was no stutter or lag on show in any of the games we tried. 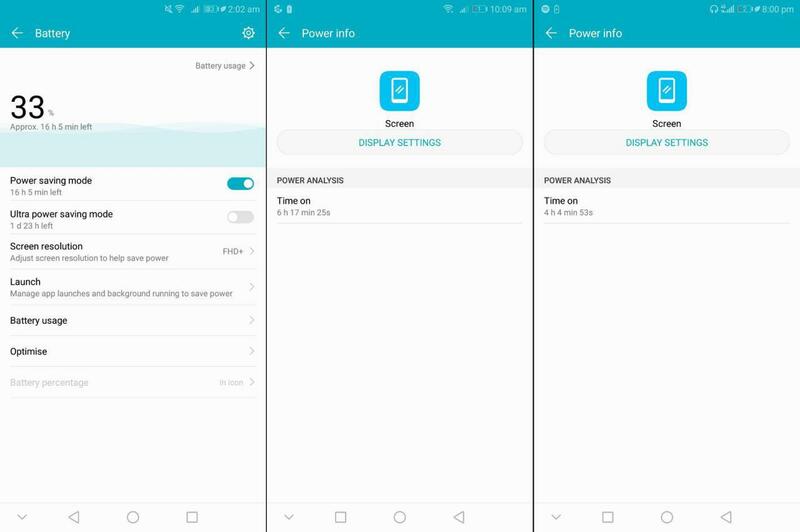 Battery life on the Honor View 10 is decent thanks to the massive 3750mAh battery. We managed to run the phone past one and a half day with light to medium use, and it could manage one day when we included some long gaming/media playback sessions. The View 10 packs Huawei’s SuperCharge technology for extra-quick charging that charges at up to 5A at 4.5V. The Honor VIew 10 ships with Android 8.0 Oreo out of the box with EMUI 8.0 overlay skin on top. The EMUI has evolved over ages the same way Touchwiz from Samsung has evolved. The UI is more fluid now and is less clunky now, although it is still far from perfect. This time we used EMUI as our default launcher not because we wanted to, but it is because changing default home app on the Honor devices is still painful and seems like Honor does not want to encourage installing a custom launcher on their devices. 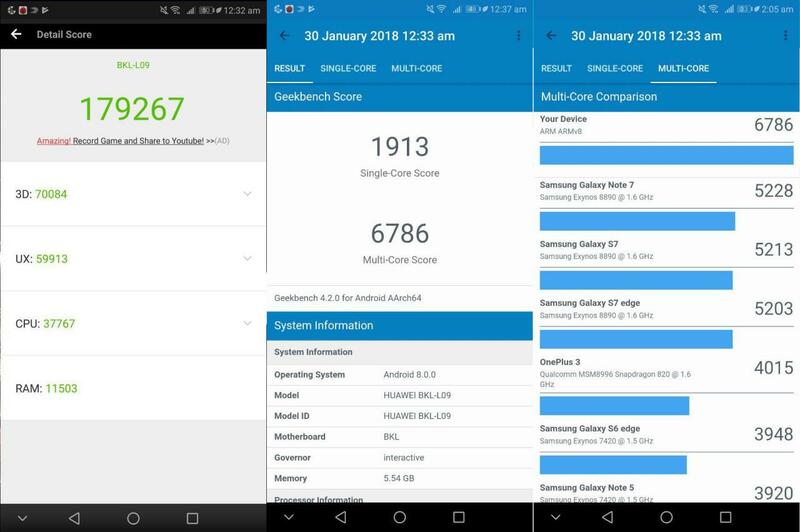 Although, we don’t regret using the EMUI, in its 8th generation the EMUI is much smarter, much faster and we totally loved the way it performs now. Alas, there are some plenty of pre-installed software that can be uninstalled. But there is no need to uninstall all the pre-installed apps, some apps are soo useful such as the Microsoft Translator app, which has been optimized for the NPU to translate text and the spoken word offline more quickly. Simply, point the camera at a menu and it’ll automatically translate the words on the screen. By default, there’s no app drawer on the home screen, though, EMUI is cleaner and less intrusive than ever. 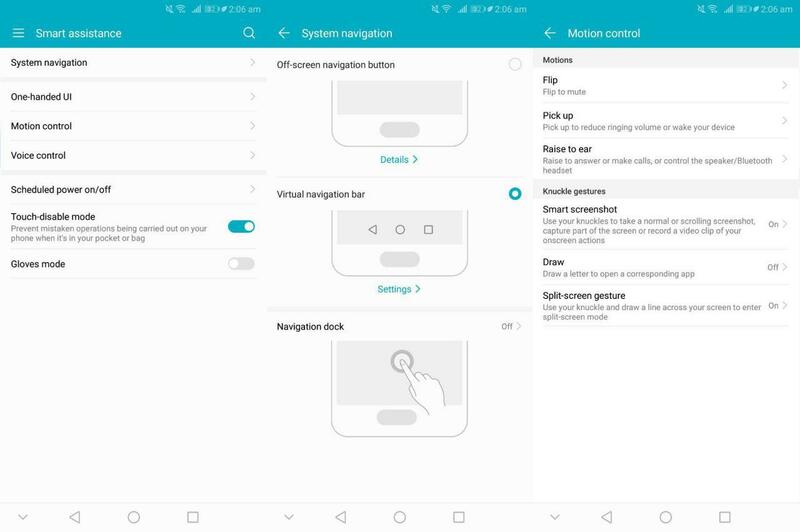 The settings menu is much organized than in older versions, and the home screen even supports the Google Now Feed on swiping left. 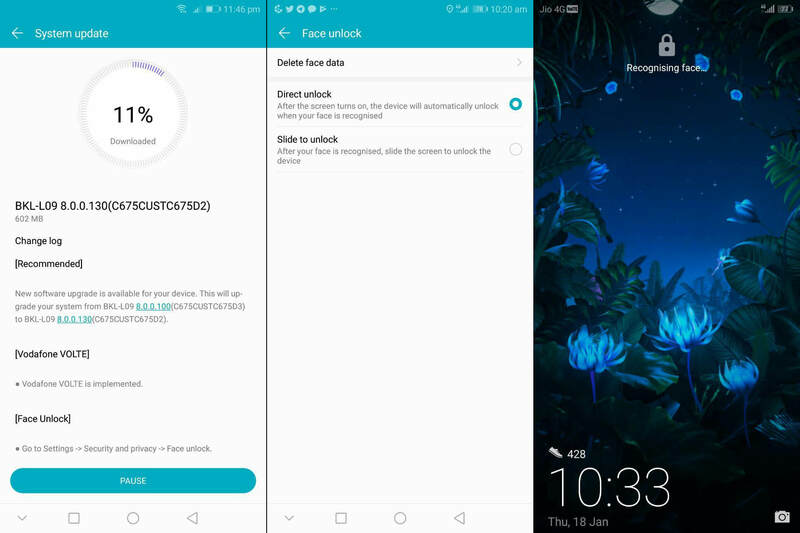 The EMUI bring such small nifty features such as swiping up from the bottom at the lock screen opens a small shade of useful tools like the flashlight or calendar or stopwatch or a QR code scanner. 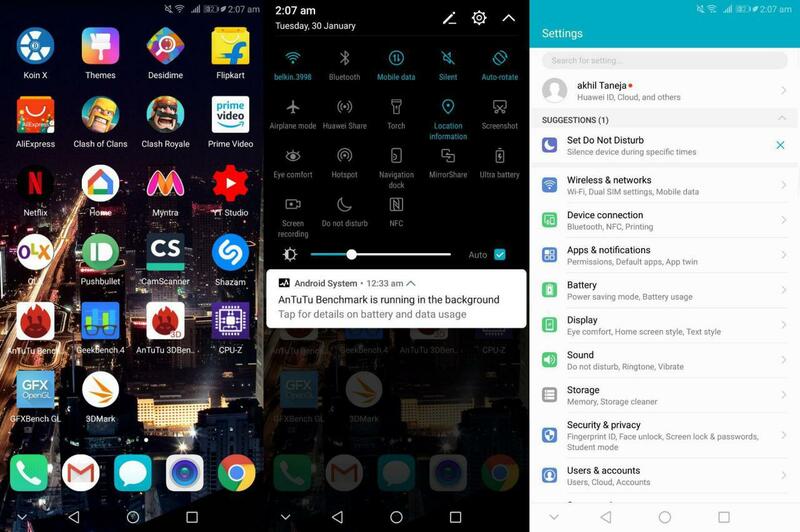 While we are die-hard fans of stock Android launcher such a Nova launcher or Pixel launcher but interestingly for a change we didn’t miss stock Android launcher on the Honor View 10. Recently Honor View 10 has received an OTA that enables Face Unlock feature through intelligent face recognition. Earlier the Face recognition was only used to show unlock notification content displayed on the lock screen but now the device can be unlocked without any swipe, just by facial recognition. Additionally, Face Unlock will detect the positioning between you and the phone and adjust display orientation accordingly. 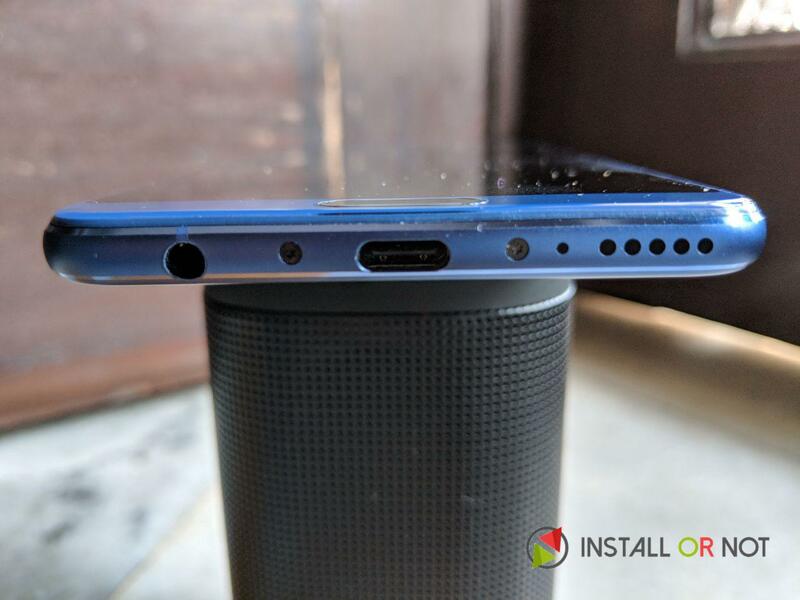 The Face Unlock on the Honor View 10 works just similar to the one we have seen on the OnePlus 5T, where you just turn on the display and look at the device. The phone will unlock the screen when you look at it. If your eyes are closed, the phone will not unlock. The EMUI is now hitting a much better balance of bringing truly useful features without deviating too far from the Android operating system. Although pre-installed bloatware can be a turn off for some but most of it can surely be uninstalled. The EMUI is far from becoming a perfect launcher but it is on the right track and is evolving to be the second best launcher after stock Android launchers. 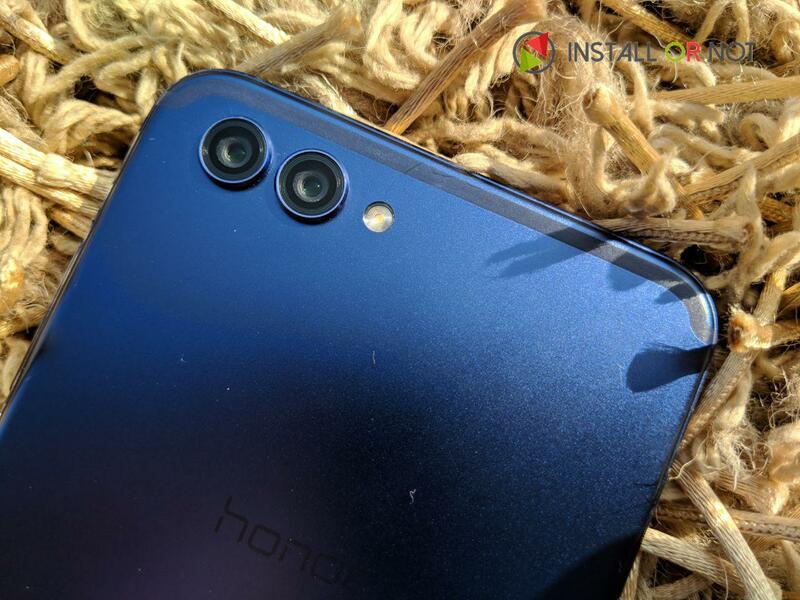 A dual camera setup can be seen on almost all devices from Honor and has become a trademark for the manufacturer. The rear protruding camera module from the back of the View 10 might look ugly but is a please for all photography enthusiasts. The rear camera module is a 16-megapixel RGB lens and a 20-megapixel monochrome lens, both with f/1.8 apertures and Phase Detect Autofocus (PDAF). The images captured from the View 10’s rear camera module are pretty impressive and even in auto mode, the View 10 rarely disappoints. Photos taken with the View 10 are good in daylight when the lighting is favorable. Landscapes are good and color reproduction is fairly accurate. Low-light photography isn’t bad either and without OIS in either lens, things can get a bit shaky at times. Lack of OIS is clearly visible in low light shots and I found the rear camera did pick up some image noise and slightly overcompensate the exposure, brightening the image. The Honor View 10 is a good device offering balance of a good hardware, impressive camera modules, humongous battery, smart AI features, an improved UI and premium build quality. And the view 10 checks almost all the boxes of a great value for money smartphone. Priced at INR 29999 the device comes face to face in competition with OnePlus 5T. In comparison with the OnePlus 5T the Honor VIew 10 falls just short of being the contender for the best value for money smartphone, the battery life is better on the OnePlus 5T, better camera setup and stock Android experience leads the 5T. While smart AI features enabled by the NPU, expandable storage, better build quality leads the View 10. In our opinion, the Honor View 10 is a highly-affordable alternative to more expensive phones, with a must-have 18:9 display and a super camera. We’re publishing this review after spending over 3 weeks with an unlocked Honor View 10 (BLK-L09). I (Akhil Taneja) have been using it on Reliance Jio in New Delhi, India. The phone was running software version 8.0.0 based on Android 8.0 Oreo, along with the January 2018 Android security patch. 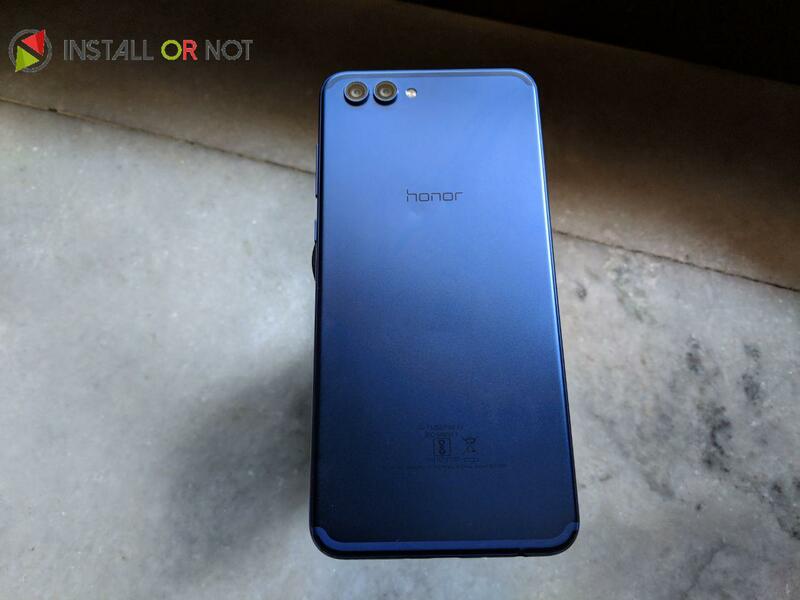 The phone was provided to InstallorNot for review by Honor.